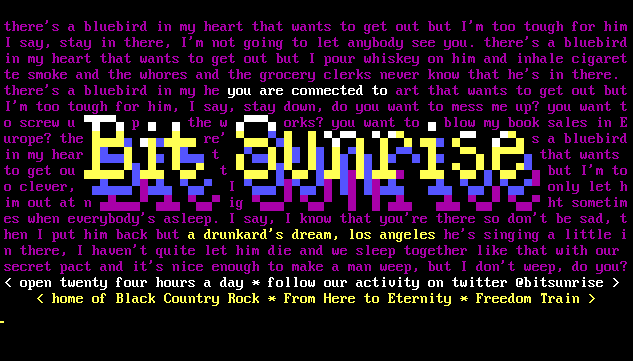 Bit Sunrise – A Hollywood, CA BBS. WHQ to Black Country Rock, a multi-format media group. 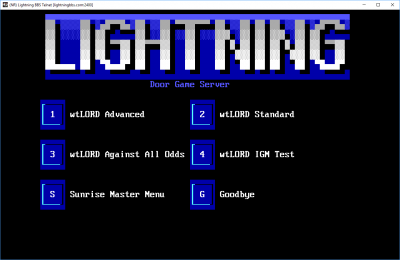 Creators of the BCR Games Server and new, expansive multi-player door games. AMiSH CA HQ, Blocktronics Distribution Board, Razor 1911 Memorial Board. 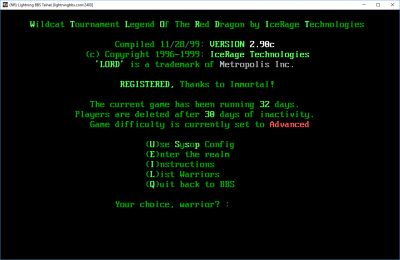 Creative home to “From Here to Eternity” and “FREEDOM TRAIN” both available on the BCR Games Server. We carry: SpookNet. RetroNet. CryptoNet. 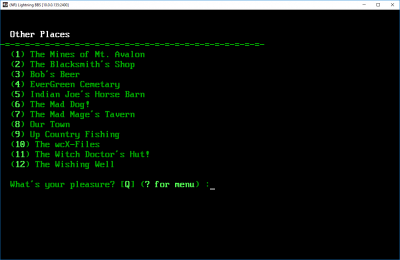 FidoNet, AgoraNet, CombatNet, DoVENeT, WinsNet and DixieNet. Huge “crazy old bookstore”-type File Bases, WikiLeaks Archive, Art Bell/Bill Cooper/Beyond The Black Radio Archive. 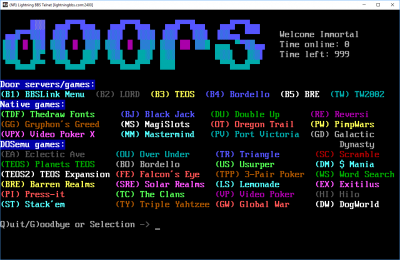 ROMS, Abandonware and more. LORD, LORD Tournament (often with real prizes! ), LORD 2, BRE, Ambrosia, The Pit, Clans. In the evenings, becomes Bit Sunset. 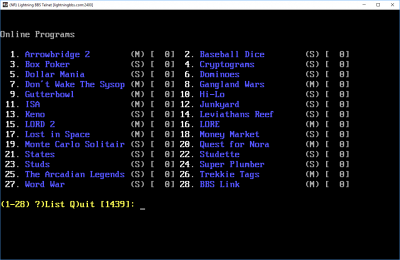 50+ ANSI Games, 60+ HTML Games. 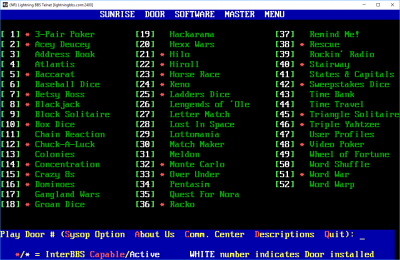 Large Filebase (DOS-WIN7) including WC4/WC5 applications. 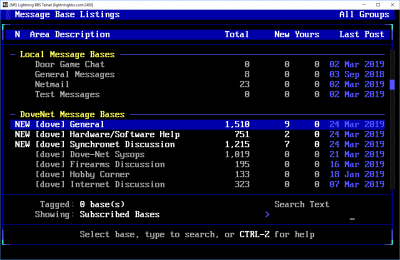 NETWORKS: FIDONET, ILINK, SSINET, and NEWSGROUPS. 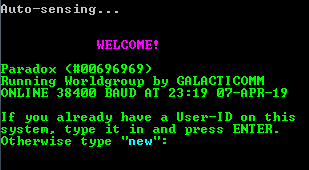 Outbound Telnet/FTP/IRC Chat, QWK/REP Packets via HTTP Ping, Lookup, TraceRoute, Finger, Whois Utilities via TELNET. 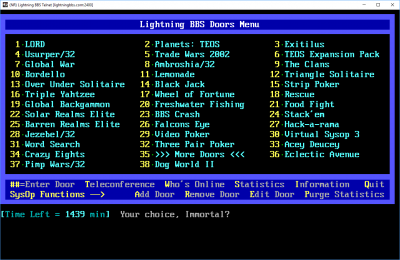 Connections available via WWW, Telnet, FTP, NNTP, POP3. 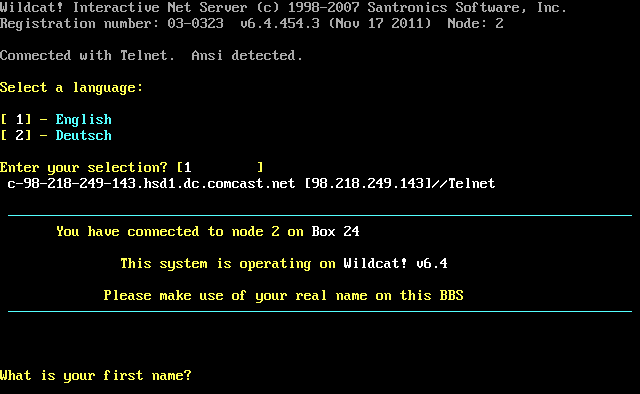 Now offering Telnet via internet browser (Flash & HTML5). Home of the ILink message network. FULL ACCESS on FIRST CALL.